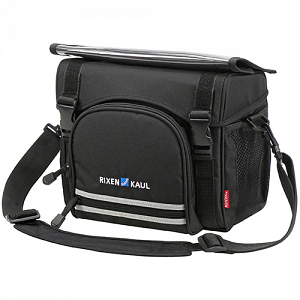 The biggest handlebar bag model in our product range with solid inner frame. The only handlebar bag onto which a light holder can be attached at the bottom. With several inner and outer compartments, shoulder-strap, rain cover and reflector, this model is extremely well equipped. Separate section for maps and cover inside the bag. The cover can be folded into 2 different formats and can be fixed onto the ergonomically shaped oblique top in various positions. The included light holder is easily supplied with 1-2 battery lights and fixed within seconds on the adapter plate at the bottom of the bag. For maps up to W 26cm x L 23cm.